using a toy submarine and some Plasticine. Thousands of children in the southern state will receive publicly-funded vouchers for the next school year to attend private schools where Scotland's most famous mythological beast will be taught as a real living creature. These private schools follow a fundamentalist curriculum including the Accelerated Christian Education (ACE) programme to teach controversial religious beliefs aimed at disproving evolution and proving creationism. One tenet has it that if it can be proved that dinosaurs walked the earth at the same time as man then Darwinism is fatally flawed. Critics have damned the content of the course books, calling them "bizarre" and accusing them of promoting radical religious and political ideologies. The textbooks in the series are alleged to teach young earth creationism; are hostile towards other religions and other sectors of Christianity, including Roman Catholicism; and present a biased version of history that is often factually incorrect. One ACE textbook – Biology 1099, Accelerated Christian Education Inc – reads: "Are dinosaurs alive today? Scientists are becoming more convinced of their existence. Have you heard of the 'Loch Ness Monster' in Scotland? 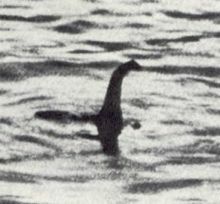 'Nessie' for short has been recorded on sonar from a small submarine, described by eyewitnesses, and photographed by others. Nessie appears to be a plesiosaur." Another claim taught is that a Japanese whaling boat once caught a dinosaur. It's unclear if the movie Godzilla was the inspiration for this lesson. However there are over thirty Schools following this curriculum in the UK. You will find a list here. This is a worrying trend as the claims made above are dubious, to say the least. For example, the statement "Nessie appears to be a plesiosaur" is probably based on photographs taken by an expedition led by Robert Rines in 1975 (not Sir Peter Scott, as is often thought - he just coined the latin name "nessiteras rhombopteryx" after seeing the photographs). However, the photos were considerably enhanced by Nasa's jet propulsion laboratory and then manually retouched. Modern computer enhancements of the original images do not show up anything that looks like a plesiousaur flipper. You can see the original image and the enhancements here. Make up your own mind! It has to be said, however, that Loch Ness does not contain enough fish to feed a breeding population of sea creatures and there are any number of reasonable explanations for the things seen on the loch's surface, most due to its great depth and the way that wind and currents interact). So how does this reflect on theology and religion? Well, the arguments for and against young earth creationism are all well rehearsed. I have covered them many times before and a summary of my objections can be found here. The fundamental contradiction of this Loch Ness monster example is that it presents speculation as fact, and that's not science.